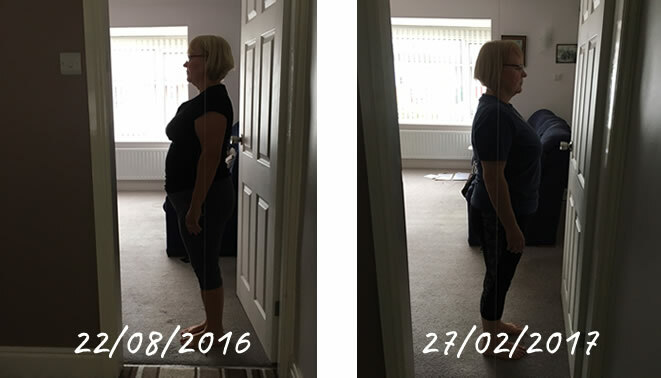 I started work with Caroline in August 2016 after being diagnosed with a degenerative back condition. I suffered with continuous chronic pain in my lower back area. I was offered Physio and pain killers and was discharged from physio after 3 sessions as my flexibility was not impaired. I decided my only option was to try and improve my posture and core strength to protect my back. I contacted Caroline and we started sessions in my own home to fit around my other commitments. We started slowly and gradually built up the moves as my posture and core strength improved. Some days my back pain was better than on other days and Caroline adapted the sessions to how I felt on the day. Over the months my posture has changed completely, as did my core strength and mobility. I can now do moves I thought would be impossible a few months ago. I have loved doing Pilates with Caroline. I have learned so much. The sessions are enjoyable, informative, and customised to my needs and ability. My life has been greatly improved and I would recommend Caroline and the work that she does.